Present state: Demolished, the embankment has been removed and an evidence of the station remains. Notes: Kinnerton station was situated on the Mold Railway Company’s (MRC) line that ran from Saltney (at Mold Junction) on the Chester & Holyhead Railway (CHR) to the North Wales market town of Mold. The line had opened on 14 August 1849, and upon completion it was taken over by the CHR, but it was worked by the London & North Western Railway (LNWR) who took over the CHR on 1 January 1859. On 12 September 1869 the Mold & Denbigh Junction Railway opened a line from Denbigh which made an end-on connection to the original MRC line thereby creating a route that would became known as the Chester to Denbigh line. The LNWR operated the services along the entire route although the Mold and Denbigh Junction section remained nominally independent until the 'Grouping' of 1923. Kinnerton station was opened by the LNWR on 2 March 1891. 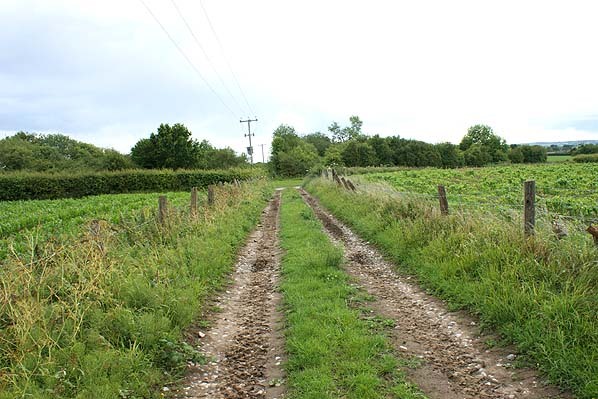 It was located in an isolated spot between Higher and Lower Kinnerton on the Welsh side of the England/Wales border, which was only a few hundred feet to the north of the station. The road running between Lower and Higher Kinnerton - Main Road - passed under the line at the south end of the station. The Denbigh line was a double-track railway and Kinnerton was provided with two platforms. It was a basic station, the booking office, toilets and storage areas being in a single-storey wooden hut-like structure on the Chester direction platform. To the north of the booking office building was a small waiting room in a separate building. On the Denbigh direction platform there was a similar waiting room in a near identical building. Main Road dropped into a cutting to pass under the line which was on a low embankment. 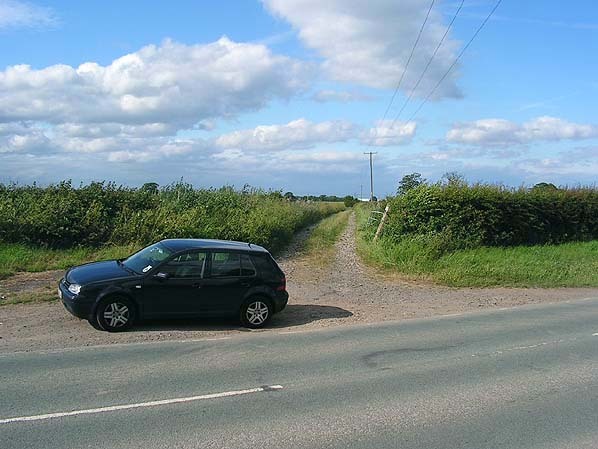 The Chester direction platform was connected to the road by a sloping path for pedestrians and by a driveway for road vehicles. A set of steps connected the Denbigh direction platform directly to the road. Goods facilities were provided in the form of a single siding and a weighing machine. At the time of opening Kinnerton was served by trains running between Chester and Denbigh with some shorter workings along the line. The December 1895 timetable showed 7 up and down trains on Monday-to-Friday as seen in the table below. On Saturdays there was an extra up service and there were no trains on Sundays. By 1904 cattle pens had been added to the station’s goods facilities. It is likely that the station was more important for goods services such as inbound farm equipment, seed and fertiliser and outbound agricultural produce than it was for passengers. The July 1922 timetable showed 6 up and 8 down trains Monday-to-Saturday. On 1 January 1923 the Kinnerton station became part of the London Midland & Scottish Railway (LMS). Little would have changed and the LMS summer timetable for 1932 showed 9 up and 10 down trains running on Monday-to-Friday. With the outbreak of the Second World War on 3 September 1939 passenger services were reduced. At the end of the war service levels improved slightly, and the LMS summer timetable for 1947 (shown below) showed eight up and seven down services. All of the up trains ran through to Chester General. Of the down services three ran to Corwen and four to Denbigh. On Saturdays there was an additional down train that ran to Denbigh. There was still no Sunday service. On 1 January 1948 Kinnerton became part of British Railways (London Midland Region). The summer 1953 timetable showed a slight improvement in the service with 9 trains in each direction calling at Kinnerton Monday-to-Saturday and no trains on Sundays. Goods services were withdrawn from Kinnerton on 5 December 1955. Shortly afterwards the siding was removed. By the summer of 1960 the service had reduced to 8 trains in each direction. Withdrawal of all passenger services between Chester and Denbigh had also been proposed and, despite local protest, the last passenger trains ran on Saturday 26 April 1962. Kinnerton station closed on 28 April 1962 and was demolished shortly after, leaving little trace. 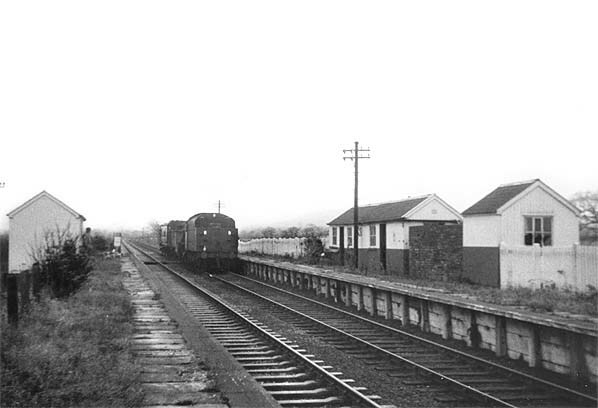 The line remained in use for goods services until 2 February 1970 when it was taken out of use between Mold Junction No. 3 and Hope Junction. It had been singled through Kinnerton at some point after 1962. It was lifted shortly after it was taken out of use. After the closure of the line Main Road was realigned at ground level cutting through the course of the railway and the southern end of the station site. Railway Passenger Stations in Great Britain A Chronology - Michael Quick - RCHS 2009. The Chester to Denbigh Railway – Roger Carvell – Irwell Press 2009. 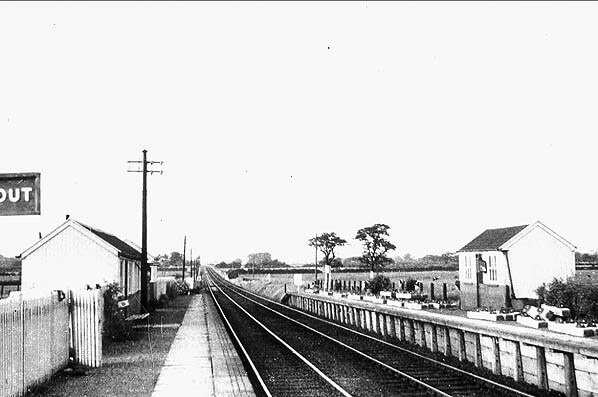 Kinnerton station looking north from the south end of the up platform on 30 June 1959. Kinnerton station shown on a 1890 map. Kinnerton station as oit was in 1911. Cattle pens had been added by 1904. The site of Kinnerton station shown on a 1964 map during the period when the line was still open for freight services. Looking south from the down platform at Kinnerton station shortly after closure. 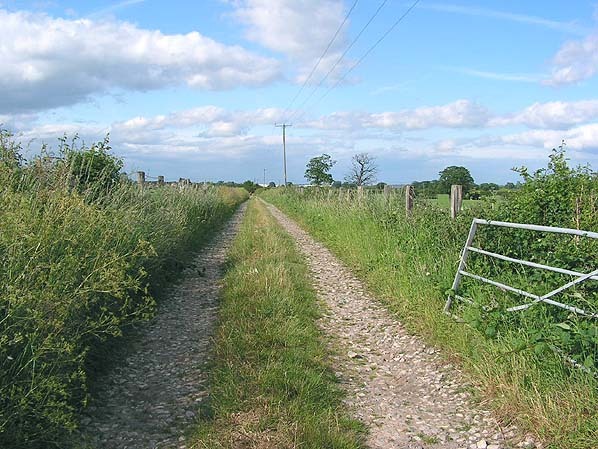 The site of Kinnerton station looking north in June 2005. The road seen in the foreground cuts through the station site. Originally its course had been further south passing under the line. The site of Kinnerton station looking north in June 2005. Looking south at the site of Kinnerton station on 23 June 2011.